Looking for a peaceful, back-to-nature experience this weekend? Join biology experts on a BioBlitz walk around UBC’s Okanagan campus. Assoc. Prof. Ian Walker and biology graduate and outdoor educator Christina Smyth will lead expeditions to identify insects, plant, bird, and animal life on Saturday, March 21, from 9 a.m. to 3 p.m. This free event is open to the public and the walks start from ART 106 in the Arts Building. These nature walks will be led by experts in various fields, including lichen, pond life, birdin, and insects. The idea is to identify as many species as possible on campus. The outing will provide students and the public an opportunity to connect with nature and learn about their local environment in a fun, interactive way. The exercise will also provide baseline data on the UBC campus biodiversity. UBC graduate Christina Smyth and Assoc. 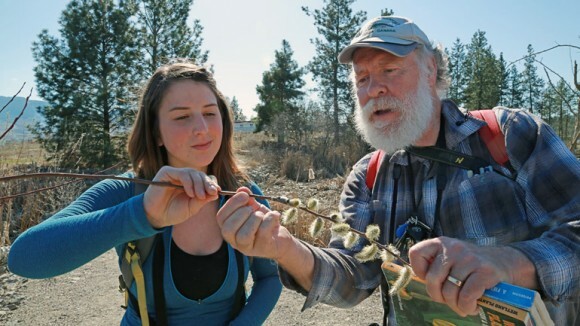 Prof. Ian Walker discuss some of the flora found on UBC’s Okanagan campus. They will be among those conducting a BioBlitz tour around campus on Saturday, March 21, from 9 a.m. to 3 p.m.